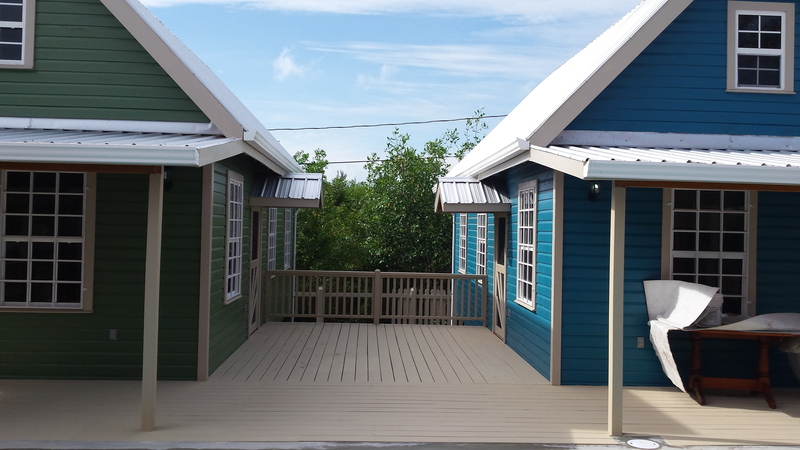 Our brand new island cottages are completed and ready to rent as of October, 2015. The four cottages are nestled around a relaxing courtyard with a pool and custom-made lounge chairs. Other amenities include cleaning service, bicycles available to rent, golf cart parking, free wi-fi, private bathrooms and fully-equipped kitchens. All cottages have 1 bedroom plus a loft and 1 bathroom to comfortably sleep 4 adults or a family of 5. Cottage Amenities: Air Conditioning, Fully-equipped kitchen, Purified drinking water, flat screen TV, hair dryer, bed linens and towels, beach towels, international cell-phone (minutes can be purchased and loaded at many local stores), lock safe and Wi-fi. Cottage Descriptions: Private 850 sq ft cottage including the loft includes hardwood floors, beams and ceilings for a cabin feel in the tropics of Belize. The fully-equipped kitchen includes a microwave, fridge/freezer, 4 burner stove with an oven, toaster, blender, coffee pot, pots & pans, eating utensils, dishes and glassware. The private bathroom has a toilet, tiled stand up shower, and sink. The bedroom has a queen bed and the loft has an additional queen bed.